The PREVERO facility was built in 2003 for investigating cavitation erosion. The facility was designed for a maximum operating pressure of 40 bar. This relatively high pressure provides high velocities and, consequently, high erosive potential for the cavitating flow. This is an essential condition to obtain significant mass loss within reasonable exposure times and to make possible the investigation of the advanced stages of erosion. The pump is a centrifugal pump driven by an electric motor of 80 kW in power. The maximum flow rate is 11 l/s. The facility includes a downstream tank of about 1 m3. Pressurization is achieved by means of a bottle connected to the tank by a pipe of small diameter in order to limit the diffusion of nitrogen used for pressurization. Liquid is tap water without any special control of dissolved gas. Water temperature is kept constant by means of a heat exchanger with a nominal power of 80 kW. 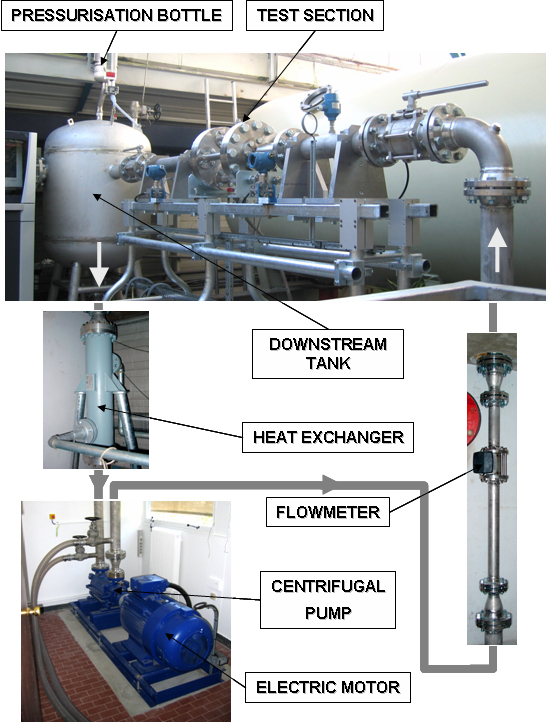 The facility is equipped with several transducers to determine the operating conditions: an electromagnetic flowmeter, a pressure transducer to measure the absolute pressure upstream of the test section, a differential pressure transducer to measure the pressure drop through the test section, and a temperature probe. The test section is about 6 m above the pump in order to avoid any cavitation of the pump. It is axisymmetric and made of a nozzle of 16 mm in diameter followed by a radial divergent of 2.5 mm in thickness. Under cavitating conditions, a cavity is attached to the nozzle exit whose length can be adjusted by changing the cavitation number, which is obtained in practice by changing the downstream pressure. The target to be eroded faces the nozzle exit. Erosion appears in the form of a ring centered on cavity closure where erosive potential is maximum. In 2009, a second test section was added in parallel to the erosion one in order to investigate heat transfer in minichannels in partnership with the Laboratoire National des Champs Magnétiques Intenses LNCMI.